Not to be confused with Potsdam Declaration. The Potsdam Agreement (German: Potsdamer Abkommen) was the August 1945 agreement between three of the Allies of World War II, the United Kingdom, the United States, and the Soviet Union. It concerned the military occupation and reconstruction of Germany, its borders, and the entire European Theatre of War territory. It also addressed Germany's demilitarisation, reparations and the prosecution of war criminals. Executed as a communiqué, the agreement was not a peace treaty according to international law, although it created accomplished facts. It was superseded by the Treaty on the Final Settlement with Respect to Germany signed on 12 September 1990. As De Gaulle had not been invited to the Conference, the French resisted implementing the Potsdam Agreements within their occupation zone. In particular, the French refused to resettle any expelled Germans from the east. Moreover, the French did not accept any obligation to abide by the Potsdam Agreement in the proceedings of the Allied Control Council; in particular resisting all proposals to establish common policies and institutions across Germany as a whole, and anything that they feared might lead to the emergence of an eventual unified German government. After the end of World War II in Europe (1939–45), and the decisions of the earlier Tehran, Casablanca and Yalta Conferences, the Allies by the Berlin Declaration of June 5, 1945, had assumed supreme authority over Germany. In the Three Power Conference of Berlin (formal title of the Potsdam Conference) from 17 July to 2 August 1945, they agreed to and adopted the Protocol of the Proceedings, August 1, 1945, signed at Cecilienhof Castle in Potsdam. The signatories were General Secretary Joseph Stalin, President Harry S. Truman, and Prime Minister Clement Attlee, who, as a result of the British general election of 1945, had replaced Winston Churchill as the UK's representative. The three powers also agreed to invite France and China to participate as members of Council of Foreign Ministers established to oversee the agreement. The Provisional Government of the French Republic accepted the invitation on August 7, with the key reservation that it would not accept a priori any commitment to the eventual reconstitution of a central government in Germany. Establishment of a Council of Foreign Ministers, also including France and China; tasked the preparation of a peace settlement for Germany, to be accepted by the Government of Germany once a government adequate for the purpose had been established. See the London Conference of Foreign Ministers and the Moscow Conference which took place later in 1945. The principles to govern the treatment of Germany in the initial control period. Post-war Germany to be divided into four Occupation Zones under the control of Britain, the Soviet Union, the United States and France; with the Commanders-in-chief of each country's forces exercising sovereign authority over matters within their own zones, while exercising authority jointly through the Allied Control Council for 'Germany as a whole'. Democratization. Treatment of Germany as a single unit. Disarmament and Demilitarization. Elimination of all Nazi influence. Reduction or destruction of all civilian heavy-industry with war-potential, such as shipbuilding, machine production and chemical factories. Restructuring of German economy towards agriculture and light-industry. This section covered reparation claims of the USSR from the Soviet occupation zone in Germany. The section also agreed that 10% of the industrial capacity of the western zones unnecessary for the German peace economy should be transferred to the Soviet Union within two years. The Soviet Union withdrew its previous objections to French membership of the Allied Reparations Commission, which had been established in Moscow following the Yalta conference. Disposal of the German Navy and merchant marine. All but thirty submarines to be sunk and the rest of the German Navy was to be divided equally between the three powers. The German merchant marine was to be divided equally between the three powers, and they would distribute some of those ships to the other Allies. But until the end of the war with the Empire of Japan all the ships would remain under the authority of the Combined Shipping Adjustment Board and the United Maritime Authority. City of Königsberg and the adjacent area (then East Prussia, now Kaliningrad Oblast). The United States and Britain declared that they would support the transfer of Königsberg and the adjacent area to the Soviet Union at the peace conference. The Three Governments have taken note of the discussions which have been proceeding in recent weeks in London between British, United States, Soviet and French representatives with a view to reaching agreement on the methods of trial of those major war criminals whose crimes under the Moscow Declaration of October 1943 have no particular geographical localization. The Three Governments reaffirm their intention to bring these criminals to swift and sure justice. They hope that the negotiations in London will result in speedy agreement being reached for this purpose, and they regard it as a matter of great importance that the trial of these major criminals should begin at the earliest possible date. The first list of defendants will be published before 1st September. The government of Austria was to be decided after British and American forces entered Vienna, and that Austria should not pay any reparations. There should be a Provisional Government of National Unity recognised by all three powers, and that those Poles who were serving in British Army formations should be free to return to Poland. The provisional western border should be the Oder–Neisse line, with territories to the east of this excluded from the Soviet Occupation zone and placed under Polish and Soviet administration. Poland would receive former German territories in the north and west, but the final delimitation of the western frontier of Poland should await the peace settlement; which eventually took place as the Treaty on the Final Settlement With Respect to Germany in 1990. Conclusion on peace treaties and admission to the United Nations organization. 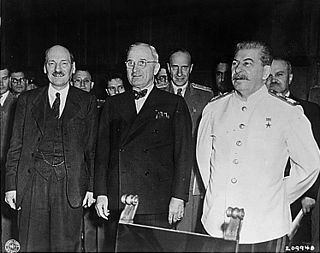 See Moscow Conference of Foreign Ministers which took place later in 1945. [t]he three Governments have also charged the Council of Foreign Ministers with the task of preparing peace treaties for Bulgaria, Finland, Hungary and Romania. The conclusion of Peace Treaties with recognized democratic governments in these States will also enable the three Governments to support applications from them for membership of the United Nations. The three Governments agree to examine each separately in the near future in the light of the conditions then prevailing, the establishment of diplomatic relations with Finland, Romania, Bulgaria, and Hungary to the extent possible prior to the conclusion of peace treaties with those countries. By that time the governments of Romania, Bulgaria, and Hungary were Communist. Italian former colonies would be decided in connection with the preparation of a peace treaty for Italy. Like most of the other former European Axis powers the Italian peace treaty was signed at the 1947 Paris Peace Conference. Now that hostilities in Europe were at an end the Western Allies should have a greater input into the Control Commissions of Central and Eastern Europe, the Annex to this agreement included detailed changes to the workings of the Hungarian Control Commission. The Three Governments, having considered the question in all its aspects, recognize that the transfer to Germany of German populations, or elements thereof, remaining in Poland, Czechoslovakia and Hungary, will have to be undertaken. They agree that any transfers that take place should be effected in an orderly and humane manner. "German populations, or elements thereof, remaining in Poland" refers to Germans living within the 1937 boundaries of Poland up to the Curzon line going East. In theory, that German ethnic population could have been expelled to the Polish temporarily administered territories of Silesia, Farther Pomerania, East Prussia and eastern Brandenburg. Because the Allied Occupation Zones in Germany were under great strain, the Czechoslovak government, the Polish provisional government and the control council in Hungary were asked to submit an estimate of the time and rate at which further transfers could be carried out having regard to the present situation in Germany and suspend further expulsions until these estimates were integrated into plans for an equitable distribution of these "removed" Germans among the several zones of occupation. Allied troops were to withdraw immediately from Tehran and that further stages of the withdrawal of troops from Iran should be considered at the meeting of the Council of Foreign Ministers to be held in London in September 1945. The international zone of Tangier. The city of Tangier and the area around it should remain international and discussed further. The Montreux Convention should be revised and that this should be discussed with the Turkish government. Directives to the military commanders on allied control council for Germany. Moreover, towards concluding the Pacific Theatre of War, the Potsdam Conference issued the Potsdam Declaration, the Proclamation Defining Terms for Japanese Surrender (26 July 1945) wherein the Western Allies (UK, US, USSR) and the Nationalist China of General Chiang Kai-shek asked Japan to surrender or be destroyed. Decentralization resulting in German federalism, along with disassemblement as part of the industrial plans for Germany. Dismantling was stopped in West Germany in 1951 according to the Truman Doctrine, whereafter East Germany had to cope with the impact alone. The northern half of the German province of East Prussia, occupied by the Red Army during its East Prussian Offensive followed by its evacuation in winter 1945, had already been incorporated into Soviet territory as the Kaliningrad Oblast. The Western Allies promised to support the annexation of the territory north of the Braunsberg–Goldap line when a Final German Peace Treaty was held. The Allies had acknowledged the legitimacy of the Polish Provisional Government of National Unity, which was about to form a Soviet satellite state. Urged by Stalin, the UK and the US gave in to put the German territories east of the Oder–Neisse line from the Baltic coast west of Świnoujście up to the Czechoslovak border "under Polish administration"; allegedly confusing the Lusatian Neisse and the Glatzer Neisse rivers. The proposal of an Oder-Bober-Queis line was rejected by the Soviet delegation. The cession included the former Free City of Danzig and the seaport of Stettin on the mouth of the Oder River (Szczecin Lagoon), vital for the Upper Silesian Industrial Region. Post-war, 'Germany as a whole' would consist solely of aggregate territories of the respective zones of occupation. As all former German territories east of the Oder-Neisse line were excluded from the Soviet Occupation Zone, they were consequently excluded from 'Germany as a whole'. In the course of the proceedings, Polish communists had begun to suppress the German population west of the Bóbr river to underline their demand for a border on the Lusatian Neisse. The Allied resolution on the "orderly transfer" of German population became the legitimation of the expulsion of Germans from the nebulous parts of Central Europe, if they had not already fled from the advancing Red Army. The expulsion of ethnic Germans by the Poles concerned, in addition to Germans within areas behind the 1937 Polish border in the West (such as in most of the old Prussian province of West Prussia), the territories placed "under Polish administration" pending a Final German Peace Treaty, i.e. southern East Prussia (Masuria), Farther Pomerania, the New March region of the former Province of Brandenburg, the districts of the Grenzmark Posen-West Prussia, Lower Silesia and those parts of Upper Silesia that had remained with Germany after the 1921 Upper Silesia plebiscite. It further affected the German minority living within the territory of the former Second Polish Republic in Greater Poland, eastern Upper Silesia, Chełmno Land and the Polish Corridor with Danzig. The Germans in Czechoslovakia, known as Sudeten Germans but also Carpathian Germans, were expelled from the Sudetenland region where they formed a majority, from linguistic enclaves in central Bohemia and Moravia, as well as from the city of Prague. Though the Potsdam Agreement only refers to Poland, Czechoslovakia and Hungary, expulsions also occurred in Romania, where the Transylvanian Saxons were deported and their property disseized, and in Yugoslavia. In the Soviet territories, Germans not only were expelled from northern East Prussia (Oblast Kaliningrad) but also from the adjacent Lithuanian Klaipeda Region and other lands settled by Baltic Germans. ^ Ziemke, Earl Frederick (1990). The US Army and the Occupation of Germany 1944-1946. Center of Military History, United States Army. p. 345. ^ Senate Committee on Foreign Relations (1950). A Decade of American Foreign Policy: Basic Documents, 1941-49 (PDF). Washington, DC: U.S. Government Printing Office. ^ United States Department of State (24 May 1949). "Foreign Relations of the United States, 1949, Council of Foreign Ministers; Germany and Austria, Volume III Document 461". Office of the Historian, Bureau of Public Affairs. Retrieved 28 June 2017. ^ "Denazification". Alliierten Museum. Federal Government Commissioner for Culture and the Media. Retrieved 28 June 2017. Protocol of the Proceedings of the Berlin Conference Official US text of the Potsdam protocols; annotated with editing variants and variant readings from the official Soviet and British texts.